This month we’re taking a break from Stanz, Zeddemore and Venkman and their adventure in Paris to follow Egon, Kylie and Melanie and their trip to Puerto Rico. The story is a really good side adventure in which we get to see characters not normally out on a bust together. The team really complement each other well. I won’t retell the story here as it’s really enjoyable and has a truly satisfying ending. Halfway through this side adventure we get a glimpse back at the Paris crew and something unexpected happens. Walter Peck says please to Peter, asking him to get the crew to stay where he can find them. Walter must not trust that the Firehouse isn’t bugged as he doesn’t state what the problem is but that he must speak to them immediately. Maybe he has found something out about Vinter? He doesn’t even mention the artwork the guys destroyed in the Louvre. The major change to this issue was the art style. British Comic Award winner Rachael Stott has brought her own unique take on the GB universe and majorly owns it. I’m not going to lie, it did take me a while to get used to it but that is only because of the years of Dan Schoening’s artwork I have enjoyed. 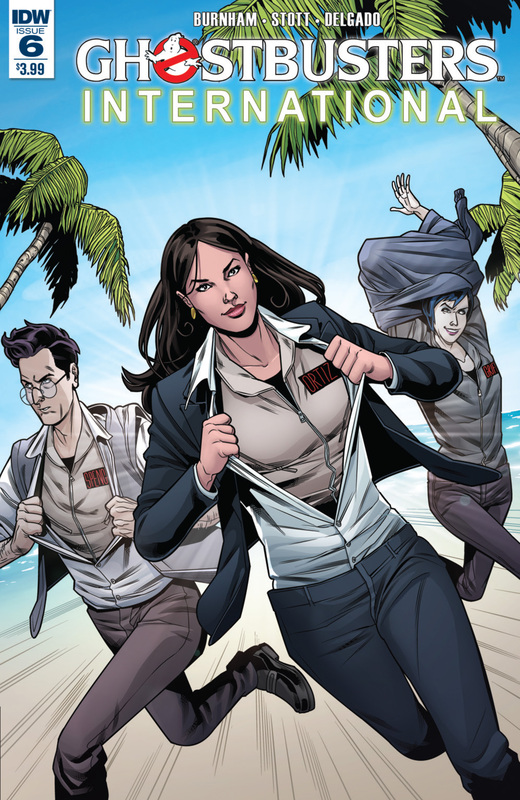 In Rachael I think IDW may have found someone who could easily take over the reins should Dan eve rwant a break or move decide on (even if this would cause Mass Hysteria). Her art style is hard to pin down but I would probably call it ‘cartoon realism’. When the characters are talking normally they look like real people but as soon as action happens their facial expressions are very cartoony. Its really good. I also think it was a smart move to use Rachael in the side story issue to introduce the new designs so in future they won’t be as initially jarring. IDW continue with their universally acclaimed ongoing Ghostbusters series, and I can see no end in sight. They have gone past the sky and are currently leaving orbit. Even as “filler” issue, this is great.